Relentless effort and a passion to ride has fueled the success of FXR Racing. Launched in the basement of his home in 1996, owner and president Milt Reimer has steered the FXR ship into a sea of success. 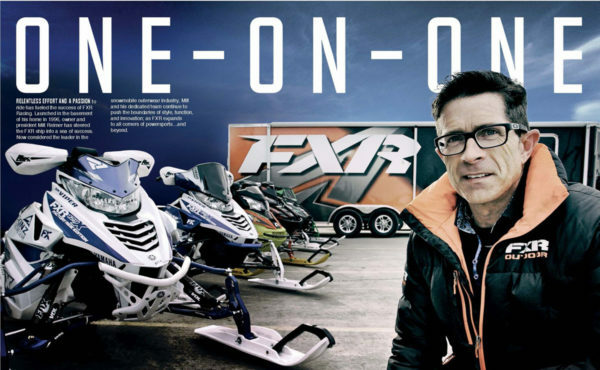 Now considered the leader in the snowmobile outerwear industry, Milt and his dedicated team continue to push the boundaries of style, function, and innovation; as FXR expands to all corners of powersports…and beyond. It seems over the past few years FXR has literally exploded. We see your gear everywhere, from the trail to the race tracks and everywhere in between. Does it feel the same way inside the company? To a large extent it does. We’ve really noticed the growth and acceptance over the past couple of years. Even in the western markets, where FXR has taken a bit longer to build brand awareness, we’re seeing our gear much more frequently. I think that’s a testament to the quality and performance of our gear. The product is being proven over and over, and riders are taking note that our technology works. But its more than just great product…we have a great distribution network, great reps in the field, great dealers…all of those things working together adds up. So yeah, we definitely recognize the success…we’ve been pushing hard and we always want to be at the top of our game. But we also know you can’t relax…the job is never done. Fortunately, we love what we do. What is the one thing that you can point to that attributes to this level of success? Relentless effort. That allows us to offer the sheer volume of product that we have. Taking the time to understand the customer…gauging customer response and sales data…and most importantly, understanding what they want and need. We are super involved in racing…we support the best riders…we have the best ambassadors…we look for any way possible that we can add value to riders, athletes, or race associations. 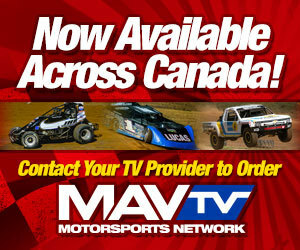 We want to be a part of the snowmobile community in a very real way. Your snowmobile product line is extensive to say the least. No one else comes close to FXR. Talk to me about that and tell me what goes into determining what you will offer to dealers and customers each year? We’re always looking for an edge, be it a new look, innovation, or technical advantage. It all comes down to gauging customer response when we come up with new ideas or new looks, and allowing that to ultimately shape our direction. But having this much product can be incredibly difficult to manage, but we can do it because of the team we have in place around the globe. The company is primarily known for its snowmobile outwear, you’ve also been active in dirt for many years. It seems the dirt side of the business has been more of a challenge? It’s been interesting, the dirt side of the business has been a labor of love for us for a really long time, but it’s really coming to life now. We were producing moto gear in the 90s…we had great designs, but the brand just wasn’t strong enough. Even though the moto line wasn’t a big success, we’d continually update the designs every 2-3 years. We focused a lot on fit and function and that progression would inspire a lot of new ideas on the snow side of the business. But now it’s (off-road apparel) really starting to take off. We’ve strengthened our team too with the addition of Andy White, who was the race director for KTM Canada for many years. And we just won our first Canadian national class championship, and we’re incredibly proud of that. There’s a lot of synergy now between dirt and snow, so the two really benefit each other and we are now seeing that more than ever. 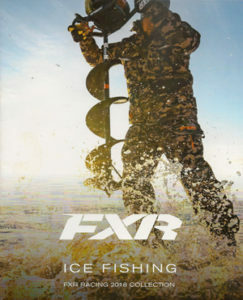 Just a couple of years ago, FXR branched out into outdoor apparel. How did that come about? We were doing some stuff with camo patterns and Real Tree when that was a really big thing a few years ago. We were doing some stuff with Cabela’s Canada and the growth and expansion into the outdoor area just sort of happened naturally. Out technologies from the snow side of the business played right into the needs of those customers. Now we’re tailoring the outdoor line even further with a new ice fishing line of outerwear and the response to that has been very positive. You’ve been doing this for a long time and FXR is an incredible success story. 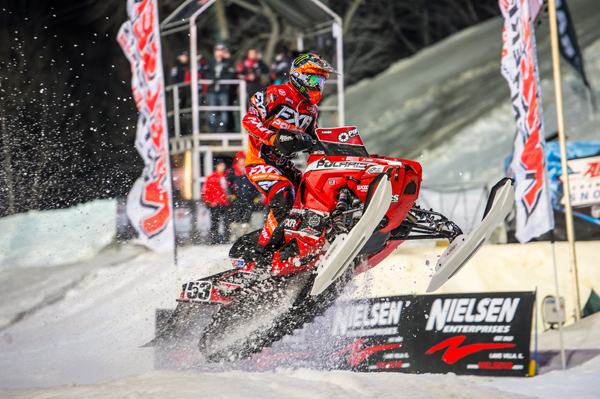 The snowmobile industry, especially outerwear can be a cut-throat business. We probably both can name a handful of clothing companies who at one time seemed to be the top dog only to fall a few years later. FXR is clearly on top of the heap right now…how do stay there? At the end of the day you have to stay relevant…you have to keep pushing the needle. We have a team and system in place that allows us to do things no one else can do. But more importantly I think it comes down to passion. Everyone here is always out riding, my team is always out there and in addition we have the best athletes, the best teams, and the best ambassadors. All of this allows us to get far more feedback to keep making the product better. It’s really just a big family of riders who together keep pushing in the same direction. We’re very passionate about what we do. At the same time, I don’t want to take anything away from our competitors, this sport has a really strong group of companies, but this is what we love and its where we want to be. 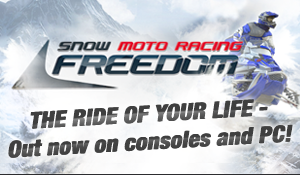 Virtually every top racer in both CSRA and ISOC national snocross tours is supported by FXR. 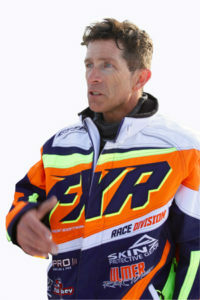 Last year’s ISOC year-end champion Kody Kamm is long time FXR rider. Racing has always been an integral part of FXR…why? Mostly because I love it…I love the athletes…they all push so hard. There’s enormous personal risk in racing and there’s a lot of reward. I grew up racing moto and snowmobiles and you understand all of that. We’re still out there riding moto all the time and we ride a lot in winter too. My crew is such an aggressive group of riders and just a great team. We go through a lot of product and equipment and the carnage of spare parts at the end of the year makes it look like we are a race team. Racing is just a very passionate thing for us and racing has played a very important role in the success of FXR. I know you can’t divulge secrets, but what’s the future hold for FXR? We’re going to continue to aggressively develop new technologies and features across all of our platforms. I think lightweight is going to be a big part of our designs going forward. We have new headwear, protective gear, boots, and gloves all in the works; and I think you’ll see more gear that has more crossover capabilities…items that can be used for different sports and different seasons. There’s a lot of synergy happening right now between all the different types of riding disciplines and its generating new ideas all the time. That’s how you stay in front.